This CellML model has been built with the differential expressions (equations 1-10) in Wein et al. 's 1998 paper. This CellML runs in both OpenCell and COR and the units are consistent. Parameter values are taken from table 1 in the paper, and r1=0.9, p1=0.99, r2=p2=0.25 (as in figure 3). 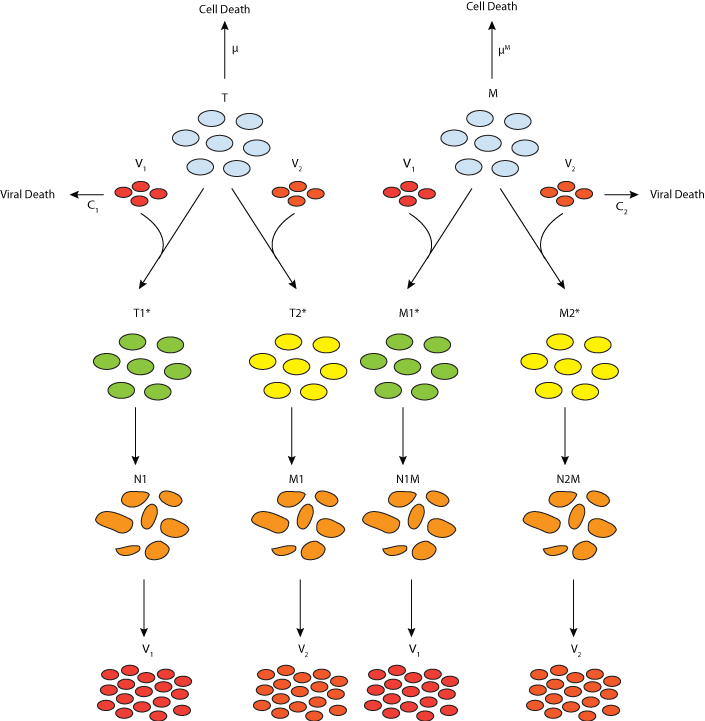 However the CellML model does not recreate the results published in figure 3. ABSTRACT: Motivated by the ability of combinations of antiretroviral agents to sustain viral suppression in HIV-1-infected individuals, we analyse the transient and steady-state behavior of a mathematical model of HIV-1 dynamics in vivo in order to predict whether these drug regimens can eradicate HIV-1 or maintain viral loads at low levels. The model incorporates two cell types (CD4+ T cells and a long-lived pool of cells), two strains of virus (drug-sensitive wild type and drug-resistant mutant) and two types of antiretroviral agents (reverse transcriptase and protease inhibitors). The transient behavior of the cells and virus and the eventual eradication of the virus are determined primarily by the strength of the combination therapy against the mutant strain and the maximum achievable increase in the uninfected CD4+ T cell concentration. We also predict, if the parameters of the model remain constant during therapy, that less intensive maintenance regimens will be unable to maintain low viral loads for extensive periods of time. However, if the reduction in viral load produced by therapy reduces the state of activation of the immune system, the number of cells susceptible for HIV-1 infection may decrease even though total CD4+ T cells increase. Our model predicts that if this occurs strong inductive therapy that reduces viral load followed by weaker maintenance regimes may succeed. Derived from workspace Wein, D'Amato, Perelson 1998 at changeset 4704fb299937.